Sunk as a target, 17 May 1979. 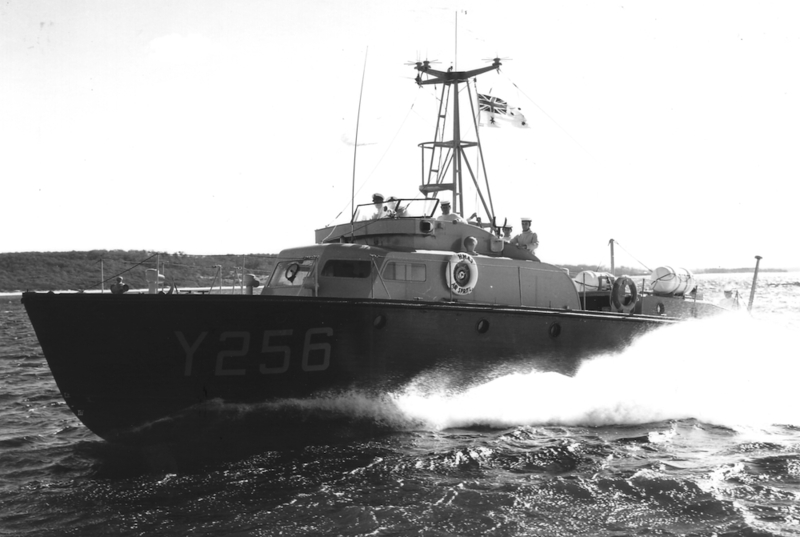 HMAS Air Sprite was the last of 21 air/sea rescue (ASR) vessels originally built in the USA and Canada between 1943 and 1945, and transferred to the RAN under the Lend-Lease Agreement. 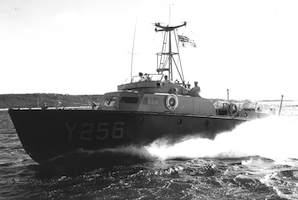 These vessels were originally designed as anti-submarine craft but their high speed and manoeuvrability made them ideal as search and rescue vessels. In this role, their hulls were painted black and their upper decks and superstructure painted bright yellow. Air Sprite was the only ASR built locally, in 1960, to an almost identical design. Air Sprite was ordered by the RAN in 1958 and was built by Lars Halvorsen & Sons at Ryde on the Parramatta River. She was commissioned on 15 June 1960 and predominantly based at the Marine Section, HMAS Creswell, at Jervis Bay, as a search and rescue vessel for the naval aircraft operating from HMAS Albatross at nearby Nowra though she did, on occasion, operate in other areas off the Australian east coast. Between August and October 1963 she visited Queensland where she assisted in trials of the Ikara missile system involving HMA Ships Kimbla and Stuart (II). However, engine defects forced her return to Sydney for repairs in September, under tow by Kimbla, She returned to Queensland waters later in the month to continue the trials. Air Sprite conducted survey operations near Fraser Island in October and acted as flagship for the Bundaberg Motorboat Club Regatta on 13 October. On 19 October, Air Sprite joined the search for a missing whaler crewed by a Naval Reserve Sub Lieutenant and four Midshipmen from HMAS Sydney (III). The crew was undertaking expedition training which required them to sail their vessel around Hook Island and back to Sydney at anchor in Cid Harbour. They were last seen in the evening of 17 October. Air Sprite participated in the search around the Whitsunday Passage as far north as Cape Upstart and also transported shore-based search parties around the islands. The whaler was found by HMAS Anzac (II), swamped and dismasted, on 21 October with the bodies of two of her crew on board. The search for the three missing officers continued but was finally abandoned on 30 October. Air Sprite arrived back in Jervis Bay on 7 November. On the night of Monday, 10th February 1964, the aircraft carrier HMAS Melbourne (II) collided with the destroyer HMAS Voyager (II) while engaged in night flying exercises off the New South Wales coast. The impact pushed Voyager bodily through the water for a few seconds before breaking her in two. Her forward section passed down Melbourne's port side, and the stern section down the starboard side. The forward section sank soon afterwards and the after section about three hours later. The disaster resulted in the loss of 82 lives (14 officers, including the Commanding Officer, 67 sailors and one civilian dockyard employee). There were 232 survivors. Melbourne was damaged but sustained no casualties. [Air Nymph having plucked numerous survivors from the water] proceeded to Melbourne and attempted on two occasions to come alongside, but, because of the heavy swell, this was impracticable. She [consequenlty] returned to Jervis Bay with 34 survivors and arrived there at approximately 01:00 hours on 11 February. After the survivors had been taken off the vessel, she refuelled and returned to the scene, reaching there at about 03:00 hours. Because the set had taken the datum further to the south, the return involved a journey of 1 ¾ hours. Air Nymph took part in the search which was then under the supervision of HMAS Stuart. A search plan had been drawn up and Stuart instructed Air Nymph to cover the south eastern sector of the plan. On searching this sector Air Nymph recovered articles from Voyager, but did not find any further survivors. The search continued until approximately 08:00 hours when Air Nymph’s shortage of fuel necessitated her return to Jervis Bay. The crews acted promptly, efficiently and with courage in an extremely challenging and traumatic situation to rescue 70 survivors from the sea, and from life rafts, following the collision. Air Sprite returned to Queensland waters in November 1964 to assist in further Ikara trials, however, a combination of inclement weather and engine defects curtailed her involvement. She returned to Jervis Bay on 17 December. Air Sprite at high speed. She was the only vessel of the class to be constructed in Australia. 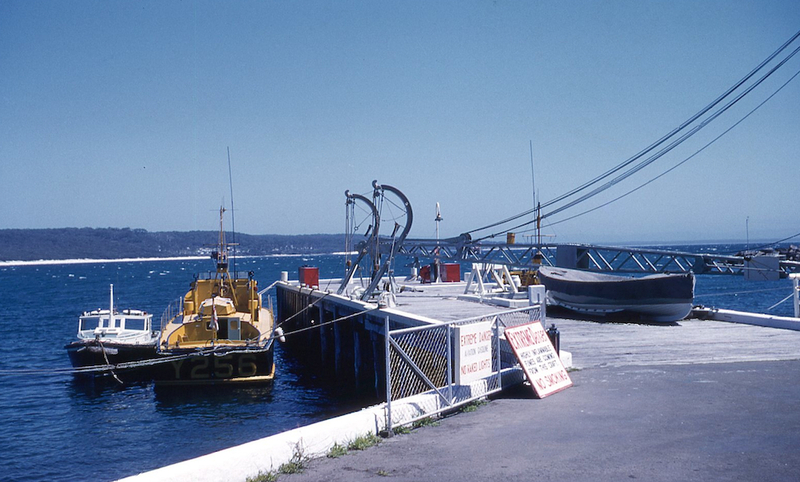 Air Sprite continued to operate from Jervis Bay, later listed as a miscellaneous auxiliary, until 1976 when she was laid up at Garden Island with the intention that she would be overhauled and re-engined prior to relocating to Western Australia for service as a general purpose vessel. It transpired that she did not re-enter service and she was decommissioned in 1977 and declared for disposal the following year. She was subsequently used as a target and sunk by a Tartar missile fired from HMAS Brisbane on 17 May 1979. A general arrangement plan of the Air-class search and rescue vessels.